Block Wagon Walker is a beautiful classic traditional toy for your little one. Brightly coloured it's tray is crammed with thirty six plain and coloured blocks, giving plenty of potential for serious building and sorting. 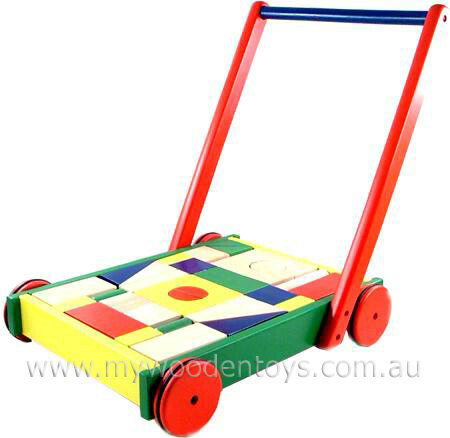 This is a sturdy walker with rubber inlaid wheels which make it nice and quiet on a wooden floor. It also grips well so it doesn't slide sideways on smooth surfaces. Apart from being able to build with the blocks it is also quite a challenge to pack them into the tray so they all fit making it a lovely puzzle. Size: Block Walkers tray is 41cm x 32cm and its handle is 46cm high. The red rectangular blocks are 10cm x 5cm x 2.5cm There are also triangular blocks, half circles and cylinders. We like this because: "We looked everywhere for a toy like this when our daughter was small. A wonderful traditional, useful, fun toy."